Pintor Fortuny 13, 8001 Barcelona, Spain. 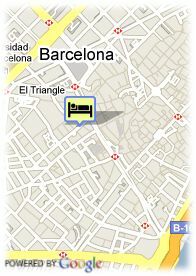 Silken Ramblas Barcelona is a 4 star hotel situated in the historic centre and at just a few minutes from Las Ramblas. The hotel is situated in the famous street of the painter Fortuna. The hotel provides a bar and the Klub, with a personal style. Its rooms are equipped with one bed or two twins beds, air conditioning, central heating, mini bar, telephone and safety cash with out charge. Paid covered parking at the hotel (22.00 €). For older children and adults 32.10 € for each additional bed is charged.